The work environment has drastically changed over the last few decades and as more people spend their work days in front of a computer, more employers want to make sure those hours aren't spent on social media. Liking, sharing and commenting aren’t allowed in one out of five workplaces as many employers block access to Facebook on company computers, finds New York-based research firm Statista. But does banning social media at work really boost productivity or does it hurt morale? To maintain productivity, employees need small breaks throughout the day that will reenergize the mind, says Kinicki. “And Facebook, personal emails and talking at the water cooler are the ways people refresh,” he says. 1. It could alienate younger employees. Employees from younger generations, such as millennials, are accustomed to using social media on a regular basis. Banning social media may send a message to your employees that you don’t trust them, says Kinicki. This can cause a sharp divide in the team atmosphere you want to create. 3. It shows lack of support. When people feel supported at work, they perform at higher levels, says Kinicki. “It’s called perceived organizational support, and it leads to employees who are more engaged and perform at a higher level,” he says. If you create a policy that says employees can’t go on or social media, employees won’t feel supported and the result may be disengagement and lower productivity. 4. It disrupts balance in the workplace. Productivity is all about balance, says Kinicki, and banning employees from Facebook is like banning them from talking about football at work. 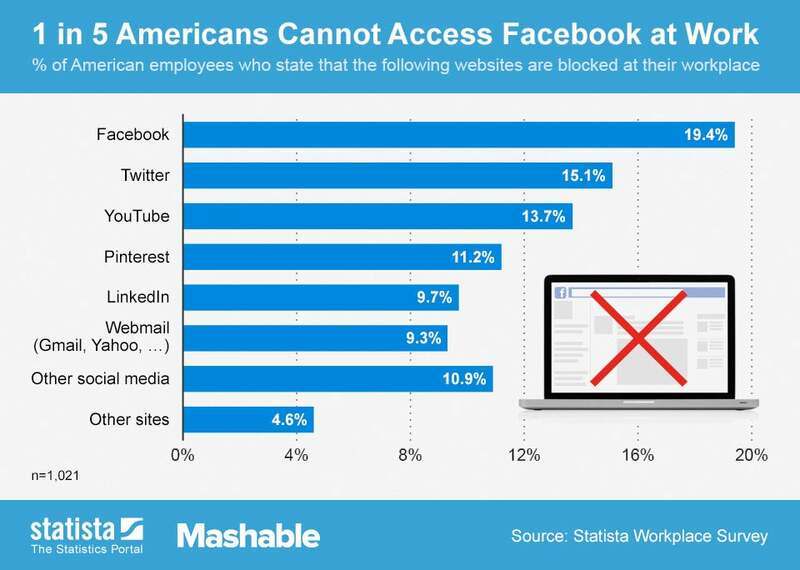 Besides, many employees find ways around social media bans by checking the sites on their smartphones.